Add to My Favorite Store. Q: What are the types of lighting? Do they have intensity adjustment? A: For this item, both upper and lower lights are halogen. Halogen lights are much brighter than tungsten lights. With the upper light reflector, the light is more even and focused. Another important feature is the intensity (brightness) adjustment. Appropriate lighting is essential for viewing, and even more important for photographing. Like using a camera, over lighting or under lighting will not show you the best details. This microscope comes with intensity adjustment for both upper and lower lights. Most low-end microscopes don't have intensity adjustment. Q: How long is the working distance and why it's important? A: Working distance is the distance between the bottom of the objective to the surface of specimen you need to focus on. This item has a working distance of 120 mm with an auxiliary 0.5x lens. Large working distance allows you to have large free room to proceed any operation. It also gives you more lighting options, e.
Ring lights, cold fiber lights. Q: Is it easy to attach an auxiliary reduction lens to increase the field of view as well as working distance? A: Field of view is the maximum size of the object you can see through the microscope. This microscope has a 48mm thread on the bottom of the objective housing so it can be attached an auxiliary lens. Auxiliary lenses could be 1.5x, 2x or 0.5x and 0.5x is most commonly used. With a 0.5x lens, you may almost double the field of view and also increase the working distance by 1.5x-2x. Some low-end stereo microscopes, from other sellers, don't have the ability to attach the auxiliary lens. We do carry the low-end microscopes, but sell at lower prices. Q: What is the size and weight of the microscope? A: Commonly, the larger and heavier, the better. 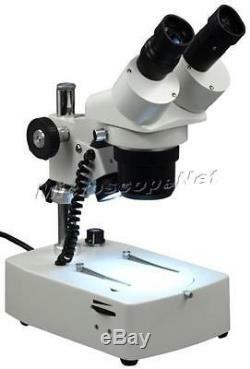 The size of this microscope is 9-7/16" x 5-7/8"x14-1/8 (24cmx15cmx36cm) and the net weight is 9 lb 10 oz (4.4kg). Brightness adjustable incident and transmitted lights. 0.5x auxiliary lenses included. Sharp stereo erect images over a wide field view. Diopter adjustment on left ocular-tube. Tool-free focus knob tension adjustment. Product GS and CE approved. Objectives: rotational 1x & 3x. Left ocular-tube diopter adjustment ±5dp. Interpupillary distance: 2-3/16" 2-15/16"(55-75mm). Working distance with 0.5x attachable objective: 4-3/4 (120mm). Field of view at WF10X eyepieces and 1x objective: 3/4 (20mm). Field of view at WF10X eyepieces and 1x objective with 0.5x lens: 1-1/2 (37.5mm). Incident (upper) illuminator: 12V/10W halogen with reflector, variable inclination. Transmitted (lower) illuminator: 12V/10W halogen. Easy illumination mode switch: OFF, I-Upper, II-Both, III-Bottom. Frosted glass stage plate: 3-3/4 (95mm) in diameter. White/black plastic stage plate: 3-3/4 (95mm) in diameter. Power supply: 110V/60Hz (US and Canada). Dimension: 9-7/16" x 5-7/8"x14-1/8 (24cmx15cmx36cm). Net weight: 9 lb 10 oz (4.4kg). Binocular stereo microscope with WF10X/20 eyepieces. Fluorescent ring light for brighter even illumination. LED cold ring light for brighter even illumination with intensity adjustment and low heat. Gooseneck fiber cold light for flexible lighting angles. Fiber ring light with low heat and adjustable intensity. Darkfield stage for gem application. Spare halogen bulbs with reflector 12V/10W (for upper light). Q: How do I select a microscope that fits my needs? We will collect HST where applicable, or GST if your province does not have HST. Please read this important message: About Communication. A: We are happy to leave feedback for our customers once we have been paid and the item has been delivered to the carrier. We would appreciate that once you receive your item, you also leave us feedback. If you feel that you cannot leave a Positive comment with all 5 stars - WE WILL EARN IT. We are here to exceed your expectations! The item "5X-10X-15X-30X Coins Binocular Stereo Microscope with Dual Lights" is in sale since Tuesday, September 23, 2014.